This thread will be used for keeping track of my build, a place for me to ask questions and to show off my build. please any and all input would be appreciated. 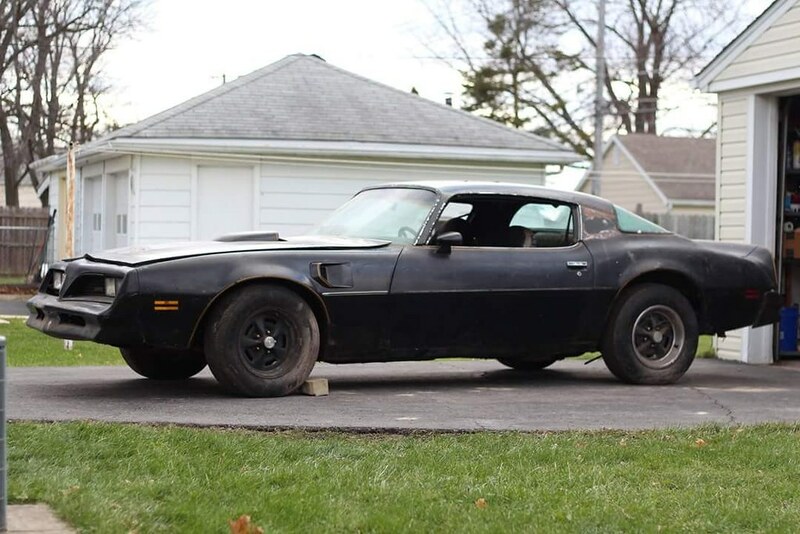 About a year ago I picked up a 1977 Trans Am 400 / TH350 car, the car is mostly solid, but is in rough condition, the plan is to do a ground up resto-mod on the car. the car itself hasn't been driven in over 20 years, it was parked in a barn and is in rough shape, the only bad parts i have noticed on the car are the rear quarter panel on the passenger side around the wheel area and the trunk floor, there is surface rust on other components, but they look to be able to clean up easy enough or be replaced. 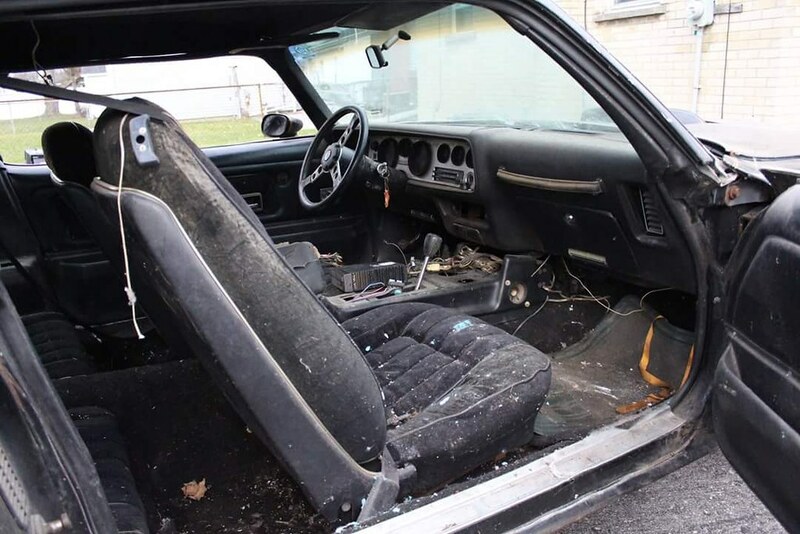 The interior is dirty, but looks to be there. It came with a bunch of extra parts also, so all in all for the price i snagged the car for, this was a good deal. (engine turns over by hand, oil is clean, and antifreeze is still bright green). The plan was always to convert the car to a manual transmission and build up the 400, but after doing some research on how much its going to cost to swap in a manual transmission (super t-10, m22, etc) I decided to look into a t-56 swap, turns out the best solution on doing those is an LS1 t-56, turns out that I found an entire running/driving parts car that I can get for a good price, so after struggling with building up the 400 or doing the LS1 I decided the LS1 is the way I want to go. So the plan is going to go something like this. So there are a few questions I have about the swap though, I've been trying to search, but maybe I'm just not looking in the right spots. - motor mounts, everyone suggest dirty dingo ones, but I wasn't sure which ones since they don't say anything about pontiacs. - headers, are there any budget long tube headers that work for the car and LS engine. - the center console in my car is one for an auto, ive read that it might be better for the t56, true? - is adapting the ls1 A/C stuff to the 77 stuff doable? - can i use the ls1 disc brakes? if so can I also use the ls1 brake booster and master cylinder? If you are good at fabbing you can make a set of mounts to use the clamshell Pontiac lowers in your TA - the Chevys are indeed different. Would be easier to swap in Chevy clamshell lowers. I would use manifolds - easy, flow well. so Its been over a year since my initial post. I just wanted to give a bit of an update on everything. Back in March I decided it was time to start ripping into the 98, I pulled the engine and transmission out and dropped the engine off at the machine shop, they have finished all the machine work and it is currently just waiting to be assembled (I told them to not prioritize mine since the car isn't ready yet, so its just been sitting all these months), I'll give details shortly on what all is being done to the engine. The transmission is sitting in the garage waiting for my stage 2 rebuild kit to be thrown at it, The transmission had some minor synchro issues, but I figured while its apart I might as well upgrade, so I went with a stage 2 rebuild kit that should support 600+ hp. I also purchased a short throw shifter, a replacement slave cylinder with remote speed bleeder and a McLeod 1434005QD hydraulic conversion kit so that I can keep stock pedals and geometry while upgrading to hydraulic setup with proper brackets, etc. The 77 has its stock engine and transmission pulled and sold, I know a bunch of people will be upset about that, but I don't plan to re-sell, so to me its not worth taking up room keeping them. the subframe on the 77 was soft on the bottom (was literally sitting on them in the dirt), so I bought another subframe to clean up and modify to accept the LS1. Basically I've just been stockpiling parts, but here is the basic parts list and whats being done. Speed Engineering adjustable setback LS1 motor mount adapter plates. - clean and underbody coat underside of car. Wow, that's a great build there! What I would suggest for your fuel tank is rather than buying one of the FI tanks from Spectre, is to either modify your stock tank or buy a new tank and modify that. What I did was used a kit from Vetteworks that allowed me to modify my stock tank to accept the 4th gen fuel pump assembly. It works great and was very quiet. any particular reason to go that route over the spectra fully assembled route? it seemed like the Spectra unit was a decent buy for $380ish with walbro 255 pre installed. my tank now is rusty. Not sure if they ever fixed it, but the baffling inside the tank was sub-par. Many people had issues with fuel starvation when the tank got below 1/2 tank. Great thing is with the 4th gen fuel pump assembly the regulated fuel that is returned goes directly into the fuel bucket that houses the fuel pump. That way there is always fuel surrounding the pump which keeps it cooler and full fuel pressure at your rails. I did this write-up a while back. The only thing I would do differently is create a recessed panel that would drop the fuel pump assembly down ~1" so that I didn't have to cut the truck. This is a write-up I did recently for my 1968 Camaro. This is how I would do the recessed panel now. In this case I used the 5th gen fuel pump assembly due to the height restrictions of the 1st gen Fbody tanks. 1) How do you plan to control the engine? Thru a factory ECU, or some other fashion? 2) How will you control the engine and also get all the information to the gauges? New gauges? What speedo will you use with the T56 sending a VSS output? In my mind, setting the LS in the subframe is easy but is only 10% of the work required for this swap- Am I off base here? Great write up Ryan! I follow along however, what did you do for the interface between the Vettework adapter and the tank to keep that sealed? The pictures make it look like you only stitch welded the adapter- were those welds all the way around? 1. Since you already have the parts car, I would use the factory ECU and have the VATS, rear 02's, skip shift and other stuff disabled so that it will run "stand alone" The LS1 computers do a fantastic job of controlling the factory engines. 2. Using the ECU to control the gauges becomes a little tricky. If you want to use the stock gauges, you can add sensors for the oil pressure and coolant temp very easily. The Volts and fuel level should stay the same unless you get a whole new tank, then you would just need to find a 0-90 ohm sending unit. The tachometer can be converted to output the V8 signal to work with the factory tach. (it give a 4cyl signal with factory settings) The most complicated/expensive gauge is the speedometer. There are a few boxes out there that will take the electonic signal and convert it to a motor drive that turns the stock speedo. I've heard mixed reviews of people saying it works great, and some say it's laggy. The other option is using aftermarket gauges. Personally I used the Speedhut gauges as they fit perfectly in the Trans Am bezels. I also think that Dakota digital makes a VHX gauge set now. I'm extremely happy with them in my 1968. There is an inner seal that seals the tank to the fuel pump assembly. That's why there is only a few stitch welds on the outer ring. Yes the easy part is physically putting the motor between the sub-frame rails. The majority of the work comes with plumbing, wiring and exhaust. 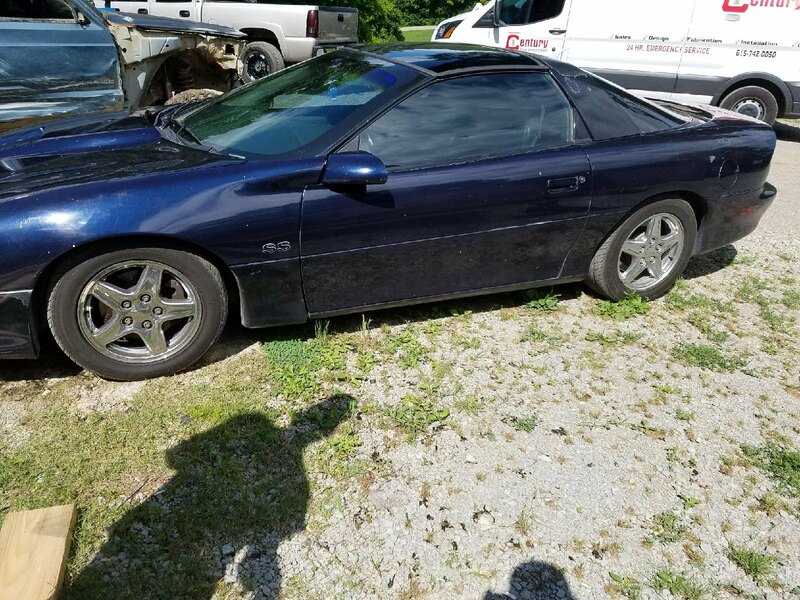 I thought I did pretty well with the LS swap on my Camaro as I was very budget friendly and still ended up spending about $4.5k including the engine trans and everything to get it running/driving. It surprised me when I actually totaled all of the expenses up. Though that does include the VHX gauges and dual pass radiator that I splurged on which were about $1k themselves.